I laugh at myself, this applies to me, and I was an overpaid Real Estate Broker or Agent in the USA. The value of the work I did was less than the amount of money I received. This is the system of Togo Real Estate Sales and Rental of Home and Property. 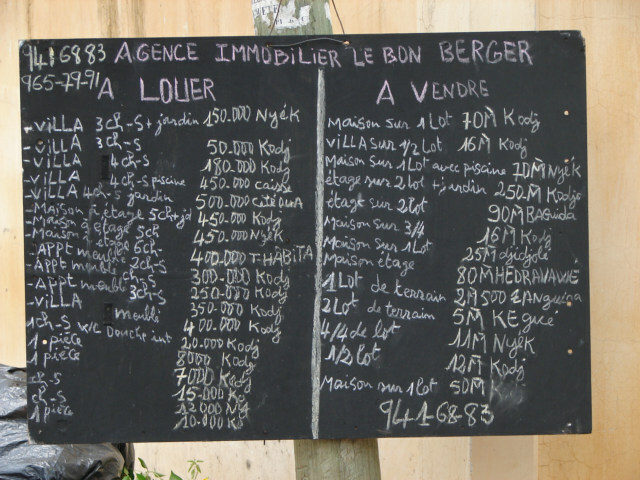 There are these chalkboards as best I understand all over the country of Togo and on the board is two sides, one is the homes for sale and other is the homes for rent, not that simple but you get the idea. If you ask a Real Estate Agent what they do, they will probably say something close to this, I show people homes or real property. Then according to the agents understanding of Real Estate law, they will slice and dice the jargon. Sadly this is true, 90 percent of real estate agents are in Key Management. In Togo and as best I know, most of the planet is the same, for sure Mexico is the same, the only other place I have been involved in an Real Estate transactions, it has been ten years, I hope Mexico has change, but I highly doubt it. In Togo and Mexico agents do Key Management only. Money, this is all about claims to money, or commissions. Agents fight over clients, who showed the property. This fighting over the showing of a property is the proof of key management, if they are fighting over who showed the property, they are fighting over key management, not over what should be their jobs, the arbitration between two groups and the creation of a valid enforceable contract. A fight over commissions is some of the best fun I have experienced in my life, one of the most hilarious comedies of errors, when watching idiots fight it is maximum fun, like watching the Three Stooges. PHASES of transaction in the USA. 1. Key Management or showing the property. 2. Signing an agreement or contract to rent or purchase. 3. Closing or signing the lease or contract. 4. Handing the keys to the buyer or renter. They skip step 2, as it is verbal. This means, the Agent is 100 percent in the Key Management business and almost worthless. The closing is done here at the office of a Notary, this is more like a Lawyer in actual practice, and this is another comedy. You can agree to a list of conditions and the Notary will then go and change all of the conditions here in Togo. Then the negotiations start again, I get to negotiate with the Notary. Which reminds me of what Agents call a good closing Agent in the USA. I have never had a difficult closing, I have difficult offers to purchase and this is where the problems are meant to be resolved, not at closing. If there is a problem at closing 100 percent, sure the agent performed negligently. A bad agent loves a good strong closing agent to finish the job they never did, so they can make money they did not deserve. Solution here in Togo. I have learned how to write a Lease in French, and I now have a Buyers Representation written in French. What makes this even more fun is there is no legal obligation of any type to pay the agent, other than the local custom of paying him one months rent. If I rented a property for 50 dollars per month, then I would need to pay 50 dollars. I rent a room for one month, the agent wanted one month… hehehe. I gave him one day. My buyer’s representation contract pays him a fee for every home he finds that I go and see, if I do not go and see, I do not pay, and there is no commission, only the fee now. What a mess, and what fun, however the great part, I can pay him what I believe is fair and not pay attention to what he said. The sad part is 90 percent of the white people now screw the agents out of commissions, because all things being equal both the buyers and the agents are crooks, not just the agent. I have it easy, I am not a crook, I pay fair fees for fair services, and I do not allow words to get in the way, I will explain managing the keys is an annoying job, best done by the guard in front of the door and guit extortion does not work on me. I personally think buying land outside my home country is rarely needed and 99 percent of the time stupid. Renting a home or land can be of value, however best done by a lawyer, not by humans, and the lawyer needed to go to Harvard, and top in his class, specializing in Real Estate, when I think there is not specialization in Real Estate law at Harvard. What am I paying the Agent now? I am paying 20 US dollars to find the keys, name of owner and the telephone number of the owner. I must look at the property or I do not owe a fee, note I said fee, not commission. I was a Real Estate Broker for 14 years, however, I became a Broker to buy, not to sell, and therefore I have not special love of Real Estate Agents. I became a Real Estate Broker because I did not like Brokers. If you buy a home, there are two Agents in involved, the Sellers Agent and the Buyers Agent. I became a Broker to remove one of the idiots in the food chain. I became a Broker to be my own Buyers Agent. If I sold a home to myself, I saved half the commission. Therefore, if a home cost 100,000 and the commission was six percent or 6000 US dollars, I was paid 3000 and the net down payment needed was 3000 less. I am also a Real Estate Broker or Sales instructor, which also bridges on insanity, because I did not teach people how to sell, I taught Real Estate Law or Real Estate Terminology and maybe 1 percent sales.